General Description: The Grand type is a medium sized, corner notched point which has a short broad blade, barbed shoulders and a wide short stem. The blade is broad, thin and triangular with convex sides. Shoulders have pronounced barbs. Stems are short and very broad and expand due to the notch form and resemble a dove's tail. Basal thinning was performed by removing a few longitudianl flakes from each face of the stem and these flakes generally extend to or above the notch area. The basal edge was dulled by light crushing and is convex. Tangs are usually sharp on most specimens. Notches enter from the corners, diagonally, some are curved upwards and can be deep and U shaped.. Most notches are two-thirds as wide as they are long. The distribution area of the Grand type in not fully understood but it appears to not be large. Most points are found in the four-corners area of Oklahoma, Arkansas, Missouri and Kansas and are encountered in small numbers. The cultural affiliation of the Grand point type is not clearly understood. The first examples reported were found in a pre-pottery level with Late Archaic occupational debris. The point has some flaking characteristics of the Afton point type but is thought to be somewhat later, probably dating from 2900 B.P. in northeastern Oklahoma. I could find no size data on the Grand point type. According to Gregory Perino, "the Grand point is thin, and the thinness was maintained even after resharpening had occured several times. Its orginal configuraiton, thinness and sharpness may indicate that it was used more often as a knife rather than a projectile point. The type was defined on the basis of only two points being found in a rock shelter, one of which was broken. The broken point appears to have a slightly expanded stem. The point can appear at times to be more basally notched than corner notched. According to Justice, "the Grand type is a morphological correlate of the Snyders Cluster". 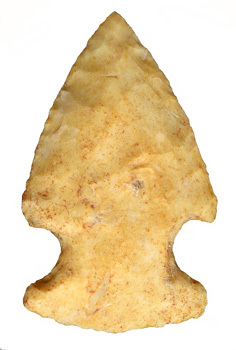 The Grand Point was named by David Baerreis and John Freeman in 1959 from specimens found near the Grand River in northeastern Oklahoma.